Big pop for Truth. Goldust hit his normal drop to the knees, punch to the face spot a couple of times. The heels worked over Truth until the hot tag to Goldust. Goldust with a spinning suplex for the win. Konnor is back after his 60-day break due to a wellness policy violation. Usual opener by Enzo and Cass, ripping the heels by asking them where their pads were and if their mommy was bringing them so they (Ascension) could go and play pee wee football after the match. Heels worked over Enzo until the hot tag to Cass. Enzo with a splash, assisted by Cass, ends the night for the Ascension returning from suspension. Corbin played football for the Arizona Cardinals but the fans did not know this as he was soundly booed. Fans tried to get behind Sin Cara with the "Lucha" chants as Sin Cara tried to attack the legs of Corbin with kicks. Corbin kept the action on the ground and finished Sin Cara with The End of Days. Lana had her hair down instead of the usual bun. Ryder and Rusev locked up and then went into a series of amateur wrestling moves. Eventually, Rusev overpowered Ryder and started stalking him around the ring dealing out punishment. Ryder, however, is like a college hoops team that is the ultimate underdog. They hang around long enough to throw a scare into the opponent. Rusev botched a climb up the ropes when he tried to knock Ryder down. Ryder had a couple of near falls teasing a title change and eventually fell to the Accolade. - Seth Rollins opened the show with a promo, talking about the three-way match* at Battleground. He railed about no one outworking him and how unfair it was that he did not have the belt. He issued an open challenge to anyone in the back for the night’s main event. Challenge accepted by Sami Zayn. At first, Rollins scoffed at Zayn but then decided that Zayn was a perfect choice. 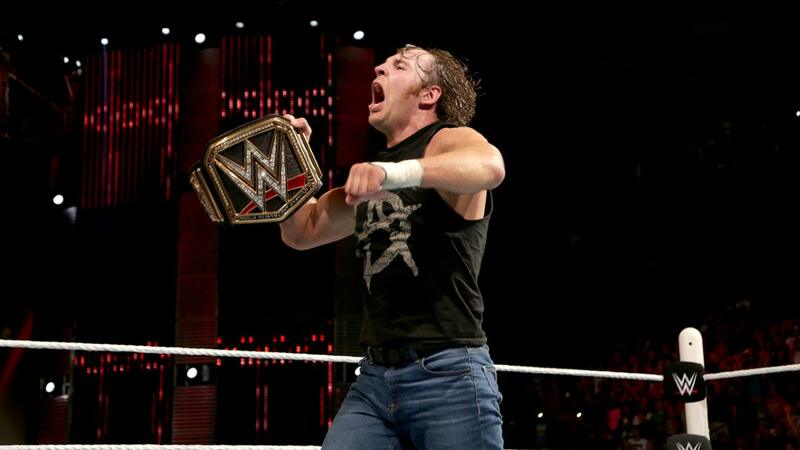 Both men were interrupted by the Lunatic Fringe as the new champion hit the ring. He called for the set people and the workers rushed the ring to set up an impromptu Ambrose Asylum complete with Mitch The Plant. Rollins was angered, but Zayn was excited. Ambrose played the part of a host behind the scenes asking if everyone was ready and if they needed anything like water. Rollins ad-libbed and said that he was parched before catching himself and telling Ambrose to shut up. Zayn goaded Rollins to fight immediately, and Rollins dropped the mic and left in a huff. *All references to the title match at Battleground were for a three-way match, so the main event seems to be continuing with Reigns in it. None of the interviews acknowledged anything about Reigns. Good, hard hitting match between the two. Del Rio started fast and went after Cesaro’s arm. Cesaro sold the beating and eventually fought back with a string of uppercuts. Del Rio hit the Backstabber and went for the Tree of Woe stomp which Cesaro countered. Cesaro climbed up and jumped off the ropes which Del Rio countered into an attempted cross arm breaker. This was countered by Cesaro who hit Del Rio with a pump handle slam and abruptly ended the match. Cesaro climbed onto the announcer’s table and bowed to the crowd to a large pop. Rematch from MITB with Sheamus all over Crews at the beginning while the rookie looked timid. Eventually Crews fought back but did not hit many aerial spots other than a sunset flip off of the ring apron. Sheamus pulled the steel steps into a vertical position and kicked Crews into them for the countout victory. - The Usos returned, and did an angle backstage with Luke Gallows & Karl Anderson & A.J. Styles. This set up Styles vs. Jimmy. Jey was ringside and played the role that Cena did on Monday, watching the back for signs of the club. AJ seemingly had a counter for Jimmy’s moves and mocked the Uso with his Phenomenal gesture. When it looked like Jimmy finally had caught AJ and had him in trouble, the Club came through the crowd to attack Jey. Jimmy jumped over the ropes and bowled the club over only to eat a Phenomenal Forearm onto the concrete floor. AJ rolled Jimmy back into the ring and hit another Phenomenal Forearm for good measure. Kofi until he could make the hot tag to Big E. Big E preceded to suplex everyone many times and the heels could not even hide outside of the ring as Kofi stalked the outside and splashed anyone hanging around outside the ring. Big E with the pinfall. The celebration was cut short by a Wyatt family promo in which Bray promised to bring pain to the New Day and that they would fall. This was over in about a minute after Charlotte interfered, allowing Dana to take advantage and pin Becky. Charlotte entered the ring to add injury to insult when Sasha Banks’ music hit to a huge pop. Sasha sauntered down to the ring in her inimitable fashion and removed her bling. It looked like Charlotte was going to engage but then she ducked out the ring and laughed at Banks. Brooke tried a sneak attack but was stopped by the Banks Statement. Rollins toyed with Zayn at first, slapping him, countering his moves, and resting on the turnbuckle while Zayn recuperated. Eventually Zayn started hitting his spots. The two went back and forth in an entertaining match. Zayn took a power bomb fling into the turnbuckle but hit Rollins with an "Undertakeresque" walk up the ropes into a hurrincanrana. Both men had near falls. Rollins went for the pedigree but Zayn reversed it into a tornado ddt. Rollins bailed from the ring and Zayn did a flip over the ropes onto Rollins. Rollins staggered back into the ring and surprised Zayn with a pedigree as Zayn re-entered the ring. Rollins gave Ambrose a cheap shot and Ambrose chased him through the ring. Ambrose laid out the belt in the ring motioning for Rollins to come back but Rollins stayed at the top of the ramp. join them if he (Rollins) wanted to. Rollins agreed and the four heels headed to the ring. Zayn rolled back into the ring to help Ambrose but they were quickly overwhelmed. The crowd was chanting for Cena but it was the Usos for the save. The faces cleared the heels out of the ring and Ambrose grabbed the mic and challenged the heels to an 8 man tag team match. The Club w/ Seth Rollins vs. WWE Champion Dean Ambrose, Sami Zayn, and the Usos. spots that he was known for. Eventually Anderson ate Dirty Deeds and was pinned. The faces stayed around and celebrated with fans. Ambrose stayed around for at least ten minutes signing autographs, taking selfies with fans and letting kids hold his belt.